Glenn Hoddle says Tottenham is in "my blood and my bones" after reinforcing his desire to be the club's next boss. The 56-year-old, who has been manager before, has been linked with a return to White Hart Lane since the sacking of Andre Villas-Boas. 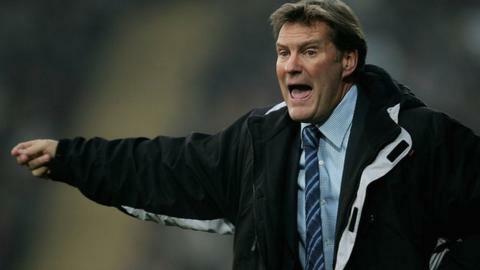 BBC Sport reported earlier this week that Hoddle was keen on a short-term or long-term role with the London club. The former England manager told Sky Sports on Sunday: "I would want to go back. It's in my blood and my bones." Hoddle played more than 370 times for Tottenham and is known to be close to club chairman Daniel Levy, who parted company with Villas-Boas after the 5-0 home defeat at home to Liverpool. The Portuguese's exit left Spurs looking for a fourth manager in six years. "Even if they felt they wanted me to go to the end of the season and wanted something else long term, I would be prepared to do that for the sake of the football club," added Hoddle, who walked out on his last management role at Wolves in 2006. Hoddle was sacked by Tottenham in 2003 after they endured a miserable start to the season, picking up just four points from their first six games. The former England midfielder continues to run an academy in Spain that focuses on keeping released players in the game. Following the sacking of Villas-Boas, former Spurs and England striker Gary Lineker wrote on Twitter: "Would love to see Glenn Hoddle given another chance at this level, has a brilliant football mind." Tim Sherwood, another of Tottenham's former players, has been placed in temporary charge while the search for a successor to Villas-Boas takes place. Sherwood, 44, played 93 times for Spurs and says he expects to be "in the frame" for the role, but is not interested in being an assistant to anyone else. He has no previous managerial experience, but was approached by Championship side Blackburn in October 2012 in their search for a manager. "I am not sure Tim Sherwood has enough experience to manager Tottenham permanently," BBC Sport pundit Robbie Savage said on Match of the Day 2 Extra. "I would give Glenn Hoddle the job, I think he is fantastic." Ajax manager Frank de Boer and former England boss Fabio Capello have both been linked with the vacancy, with the idea of an interim appointment taking charge until the summer also a possibility. Swansea's Michael Laudrup has also been mentioned, but the Dane has said he would never leave a club halfway through a season.